By John Schubert, Editor of The Russian River Historical Society. This article originally appeared in the newsletter Yesterday & Yesteryear, December 2010. The earliest pioneer who located in today’s Rio Nido Canyons was William Fry, sometimes spelled Frey. This 28 year old, listed as a laborer, was known to be in the area as early as 1860. By 1864 he was in possession of a quarter section (160 acres), which is now all of central Rio Nido, and all of its virgin redwood forest. No records or histories show if he built a home here or not. The Korbels became owners of Fry’s land prior to 1876 plus those acres to the north and east of it. They had a mill operation at the time to the east where their current wine cellars are today. The arrival of the railroad came in the spring of 1876 to Korbel and continued on. At Fry’s Creek (the entrance to Rio Nido) a culvert was constructed for the overlaying railroad bed. The railroad arrived at Guerneville in February 1877. Today’s River Road goes over this original railroad landfill. The railroad opened new logging opportunities for Korbel. Typical of the times, when timber was logged out in an area the owners would move to a new location. The Korbels where now different. They had their mill erected in Rio Nido in 1881. With the last of the timber cut they pulled out their mill in 1886. The ownership of the land didn’t change until 1905. In 1904, the Elks’ Club was seriously looking at the property for purchase as a vacation park and resident location similar to the Odd Fellows’ Park just upstream of Korbels. However, the Elks’ national board of directors decided not to attain ownership after much revue and discussion. In 1905 the Russian River Land Company was formed and purchased the land from the Korbels. Roads and building lots were surveyed. In 1906 Rio Nido Road was built over to Mercury Road, known today as Armstrong Woods Road. It was 1907 when the property was divided and lots were sold. Bungalows and cabins were thrown up among the young and short second growth redwoods. 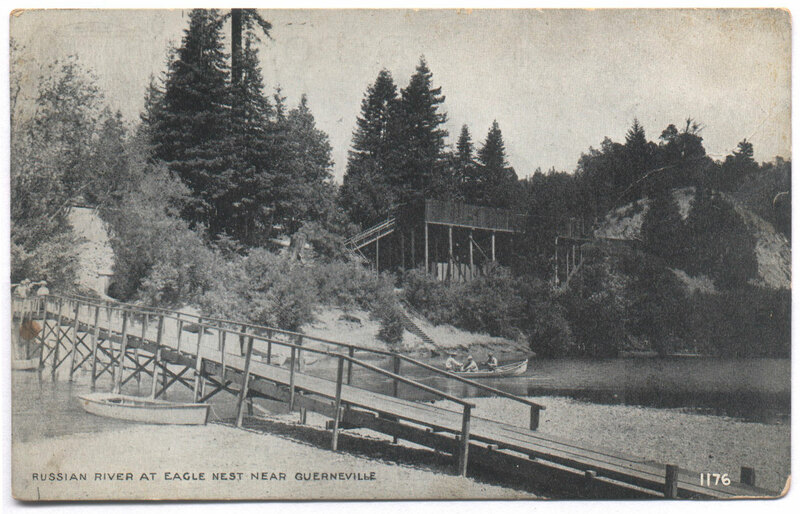 The first commercial buildings in Eagles Nest were all designed as rustic structures, like the cabins and bungalows, all in keeping with the rustic nature setting of the redwoods scattered in the area. These were unpainted raw board stores with railings and banisters similar to redwood limbs ringing the porches. Enough people had made residence there that the U.S. Post Office Department established Eaglesnest post office on May 23, 1908, and appointed Gilbert P. Hall its first postmaster. Two years later on May 23, 1910, the U.S. Post Office changed the name to Rionido. This single name, remained until June 1, 1947, when it was changed again to Rio Nido. About 1915 William Smith purchased the property of central Rionido and founded Rionido Incorporated. Under his direction, money, and labor Rionido became a resort and not just a location for summer homes. In 1918 major construction of permanent year-around structures was under way. Since he came from England, Smith had the hotel and other summer concessions built in the Tudor style architecture. 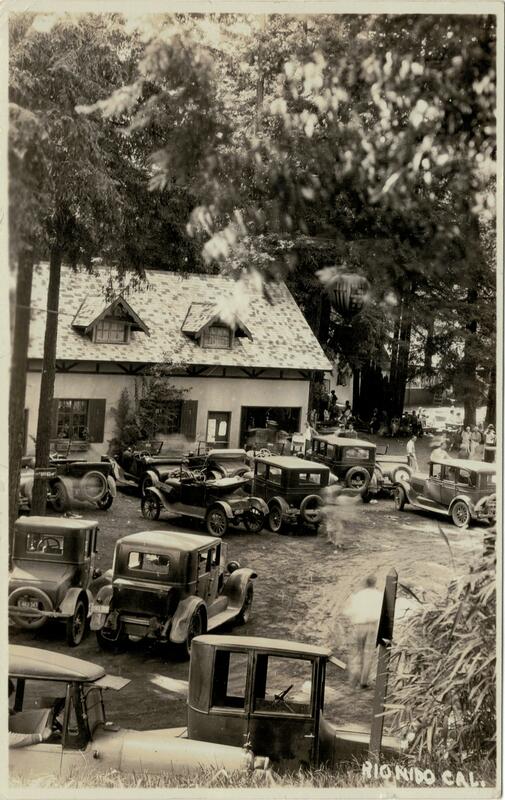 At the same time A. J. Froehlich established his “Tent City,” the second largest “resort” in Rio Nido. William Smith Died in 1923 so son, Guy Duncan Smith, took over the resort. Some time during the ‘20s the Smiths took on Dr. Ross Hamlin of Santa Rosa as a partner. In 1926 or 1928, Harry Harris bought out Guy Smith and joined in partnership with Dr. Hamlin. It was probably Guy that created the phrase “Memories That Linger,” as this famous phrase was on a 1925 brochure. That other icon, the Winking Moon looking down from the redwoods, was up by 1937 and probably earlier. It was approximately 6ft in diameter with a face on light orange cloth. It had 10 to 12 lights around the rim behind this and at night were turned on. A light behind the left eye blinked making it appear it was winking. It was typical of, the ‘20s and ‘30s, that nearly every village and town along the River had a dance band all summer long. They were college bands from around the Bay Area. 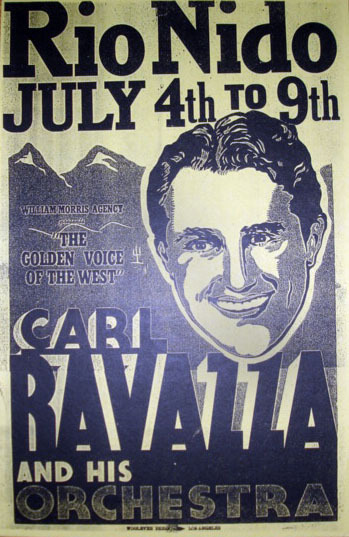 Reg Cole and his group were a fixture at Guernewood Village Bowl, and Larry Rapose with his band at The Grove in Guerneville. Rio Nido bands held sway at The Dance Hall. It was an open-air pavilion that spanned Fry’s Creek. 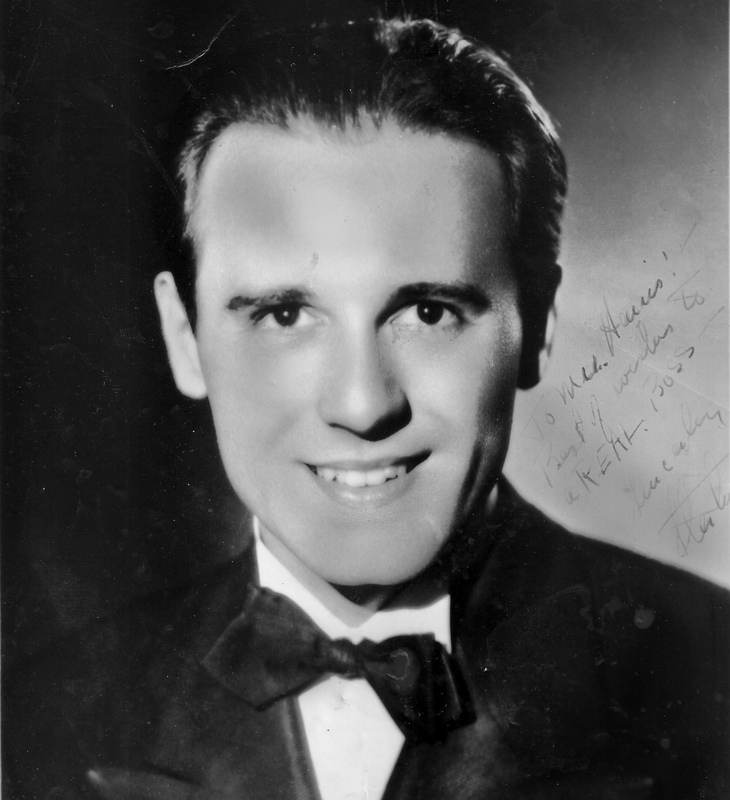 Returning seasonal bands were Pete Horner, a professional musician in the late 1920s, next was Chuck Dutton for ’30 and ’31, followed by Lee Searight through the mid ‘30s. In 1938 the hall was roofed over by local contractor Jack Shatto. Interspersed with the summer-long bands were the one-night stands of The Big Bands of the 1930s, ‘40s and ‘50s. The names are legend: Ozzie Nelson, Phil Harris, Harry James, Woody Herman. The list goes on. Other entertainment, if the vacationer didn’t wish to dance, was sitting around the big evening bon fire just outside the dance, going to the local movie – silents of course. The Harris family pretty much ran this operation at the end of the ‘20s. Rose Harris (mother, and spouse of Harry) sold tickets, 10 cents each while son Herb was the projectionist. In 1940 Harry Harris bought out Dr. Hamlin and Guy Smith thus becoming sole owner of Rio Nido’s commercial center. Note that Rio Nido as two words was in use by the general populace as early as 1930. And later in 1947 the Post Office switched from one word to the more common two-word name. In 1953 the Harris’ sold to the Magliocco brothers, Emil and Sam of San Francisco. Many thanks from the editor go to Clare Harris and Aline Harris for their contributions to this history.